Imagine this: it’s a bright sunny day at home, you’ve just finished hanging out the laundry, and now’s a good time to sit down and sip a coffee. Only just then, the doorbell rings. You open it, expecting your Amazon delivery, to find a smiling stranger at your door…but she doesn’t have any parcels. Instead, she claims she’s a local tour guide – and boldly asks if she can come in for an quick impromptu visit. With a group of tourists. What would you do? Slam the door in her face, or maybe lodge a complaint? If you live in Mongolia, you let these uninvited guests in. An uninvited guest was what I found myself to be when, after a long morning tracking deer and Prezwalski’s Horses in Hustai National Park, our trio of shutter-happy sightseers decided we had enough extra time to visit a local Mongolian family before the drive back to Ulaanbaatar. After a quick consultation with our driver, our guide Boogii told us we’d be going to a nearby homestead. After a 20-minute drive with no way of knowing if we were even heading in the right direction, we arrived at a cluster of three gers (Mongolian yurts). I was about to open the door and hop off the van, but Boogii stopped me. Shocked? William, our photography workshop leader, explained that this is how things work in Mongolia. In such a sparsely populated place, people help and welcome one another. Some of his friends of his even went on a horseback expedition across the country, largely relying on nomadic families they came across to provide them with food and shelter. This obliging culture also explains why, when making our way from Bayan-Olgii to our host family in Saagsai during the Golden Eagle Festival, we’d stocked up on supplies like bread, biscuits, sweets, and water. Whenever we met an eagle hunter traveling on horseback, we’d hand out refreshments. With this in mind, it wasn’t too surprising when Boogii beckoned is out of the van to meet our hosts. 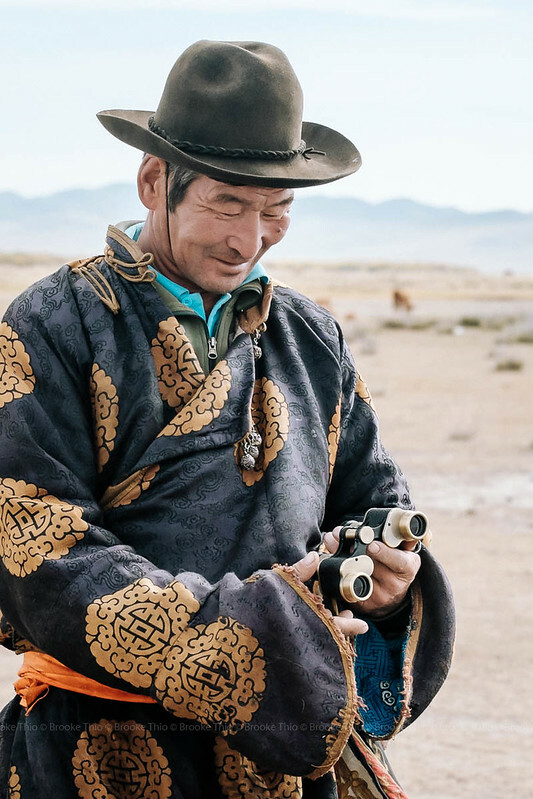 The gers of Mongolian nomad families bear little resemblance to those in a Mongolian ger camp, which is typically set up at national parks to cater to tourists. The yurt is pretty much a “tiny house”, like a studio apartment, except it’s round. We were invited to sit down, but Boogii warned us not to pass between the two central pillars, or bagana, that support the ger’s crown (toono). “The two pillars represent the man and woman of the house, so you should never ever walk between them. We believe it will bring disharmony and conflict.” As Boogii spoke, our driver handed us the bowls of suutei tsai – Mongolian milk tea – from around the pillars. I observed as the young wife went back to her wok on the stove: bringing up huge scoops of milk tea and letting it cascade back down, over and over, building a thick creamy pile of froth. She answers our questions as she works. Pastoral nomads in Mongolia live a lifestyle not unlike that of livestock farmers: early to bed, early to rise, and a whole day tending to the herds of cows and yaks and horses. In addition to cooking and caring for the kids, Mongolian women are responsible for tasks like sewing clothes (including heavy winter coats), milking (two to five times a day), and making dairy products out of all that milk (butter, cheese, airag fermented horse milk, and yogurt). You might think that’s a crazy amount of work, but then out here there’s no Internet, no malls or cafes, no neighbors to gossip with. In this context, having a TV doesn’t seem like such an abomination. Back to the food. I’d been hoping to try some of the famed airag, but sadly it wasn’t in season. Instead, our host offered us some homemade yogurt. Runny, plain, with a sprinkling of sugar. I took a spoonful and swooned. I hesitate to use the term “fresh”; is “fresh yogurt” not an oxymoron? That was what it tasted like, though – utterly fresh and zesty with bright citrus notes and a clean aftertaste. It was so delicious that I convinced William, who claimed he’d never enjoyed yogurt, to try some. It’s still the best yogurt I’ve ever tasted in my life. As it turned out, this family was working with tour companies in Ulaanbaatar to offer homestays for tourists, and they invited us to stay for lunch since they were already preparing it for their guests. While the women of the household busied themselves next door, we stepped outside to greet the head of the family – in Mongolia, typically the eldest male – who had just returned from showing the tourists around. Dressed in a traditional Mongolian deel, it was hard to imagine that this gentleman had been a former ranger and city-dweller in Ulaanbaatar. He’d moved to the capital for two years to study while working as a plumber, but eventually decided to return to the countryside because he felt it wasn’t worth it. Unlike the jet-setting ways of today’s digital nomads, traditional nomadic herding is a tough lifestyle that few would promote. Instead of a backpack, you have an entire yurt of stuff to pack up and load on a pickup truck (or a few camels!) Instead of checking email on your laptop, you check on hundreds of grazing animals. For Mongolian herders, in particular, the climate is an annual challenge: in exceptionally severe winters, known as dzud, scores of livestock are lost. Since winter in Mongolia typically means temperatures of -30°C or more, few outsiders – myself included – would venture a homestay with Mongolian nomads during this time. In the summer, though, the Land of the Blue Sky is one of the most beautiful destinations you can visit. If you want to live with nomads in Mongolia, you should be prepared to get hands-on. A Mongolian homestay experience usually involves tasks like herding, milking, collecting water or dung (for fuel), making dairy products, and perhaps even helping to catch horses. You can arrange for a stay as short as 1-2 nights or as long as a few weeks. May-September are the best times to visit Mongolia. In October it starts snowing and temperatures drop well below freezing! While Mongolia conjures up images of rolling plains that stretch to infinity, the fact is that different areas of Mongolia offer unique landscapes of their own. Ulaanbaatar: This is ideal if you have limited time in Mongolia. You can find ger homes listed on Airbnb, some of which also offer horses for riding. Gobi Desert: I would definitely recommend Boogii as your guide. She’s from the Gobi so she knows its heritage and people like no one else. Boogii also runs a Mongolian homestay with nomadic families in the region. You’ll find her to be an exceptionally capable and warm lady who will most likely end up as your friend! North and west Mongolia: consider Zendmen Travel, who arranged the photography workshop I joined. Two of their founders were born in western Mongolia and their team can arrange a stay with local Mongolian families, be it the Kazakh eagle hunters or Tsaatan (Dukha) reindeer herders. You’ll definitely need a local tour agency to arrange travel around Mongolia – especially since it’s a country where roads names and addresses aren’t a priority. Even if you plan to travel independently by bus, you’ll need to ask for translations and instructions from your hotel/hostel staff. You can also get to Ulaanbaatar by rail on the Trans-Mongolian railway (which connects to the Trans-Siberian) from Russia or Beijing. Have you been to Mongolia and stayed with local nomads there? What would you be most interested in learning about? A friend of mine had the same experience and loved it as much as you did. Mongolia is truly authentic. Lovely post! This sounds like an incredible, once in a lifetime experience! Greatly written piece as well. Thanks for sharing with us. Wow! I would be super keen on doing a homestay in Mongolia as I am always interested in local life, cultures and traditions. I have been staying with locals in a tiny little village in Malawi. They still use water pumps, have to carry the water for bathing and cooking to their home and also cook on fire. The bathroom doesn’t have taps, nor do they have a shower or flushing toilets. It was such an incredible experience. I totally encourage everyone to do it as you learn so much. Thank you for sharing your post. Props to you! I spent a month in a similar situation in Kenya and it was a real challenge in addition to the cultural differences. A homestay in Mongolia is easier, mainly due to the cold and dry climate, but in all honesty a week is probably the max for me. I always want to go to Mongolia. Such an amazing place and an incredible experience to be with the locals. May I know if this homestay thing costs money? Or is your guide paying them money? Just out of curiosity. Yes, it’ll cost money just like staying at a guesthouse/Airbnb. If you go through a tour operator then you pay the tour operator, who will then arrange everything for you. Wow, just wow! I always look for off the beaten track experiences and destinations and that’s definitely one. Will save the article for when I can plan a trip to Mongolia! It’s such a lovely experience to step into your shoes through your writing, to experience how visiting the locals on such an impromptu basis felt like! They’re so hospitable – a stark contrast between our mentality being city-dwellers. Also loved the insight from the man who shared how he felt the difference was between living the city life vs living outdoors. Mongolia remains on my to-visit list! Hopefully one day, I can experience visiting it! Kristine, you’re always so generous with your praise 🙂 But one thing that westerners might not be used to is that they don’t smile that much. Yeah that guy’s perspective was quite refreshing, a shame I didn’t get his name. Wow, this sounds like the most amazing experience. I haven’t stayed in a homestay yet, but definitely keen to do so one day.